All calves should receive 2-4 Litres of good quality colostrum in the first 12 hours of life. Calves should be reared in a sheltered and hygienic environment. Calves need good nutrition that allows growth and causes rumen development. Calves are born without immunity to the bugs in the environment. Colostrum (first milk) provides the antibodies needed for protection PLUS energy and PROTEIN to get the calf up and going. The calf can only utilise colostrum in this way in the first 12 to 24 hours of life. Colostrum can vary greatly in how much protection it provides and it is impossible to judge the quality of colostrum by its appearance. Heifers, cows that run milk before calving and sick cows are likely to have poor quality colostrum, but other cows may also have poor colostrum. The only way to work out the quality of colostrum is with a BRIX REFRACTOMETER or next best a COLOSTROMETER. See article on Refractometers. Ideally colostrum should not be pooled from a number of cows. In reality, this is often what happens. Our advice is to test the quality of this colostrum bank with the Brix refractometer. Since 30-40% of calves left on a cow will fail to get enough good colostrum, calves should be removed from the cow as quickly as possible and given 2 litres of good quality colostrum. Another 2 L should be given 6 hours later. Calves which do not receive colostral immunity are much more likely to get sick and die and will grow more poorly. Cleanliness with colostrum is critical. If colostrum gets contaminated with faeces and/or equipment used is not kept extremely clean, you will be drenching the new born calf with billions of bacteria. This can infect the calf with disease. In other cases, the bacteria interfere with the calf absorbing the protecting antibodies. 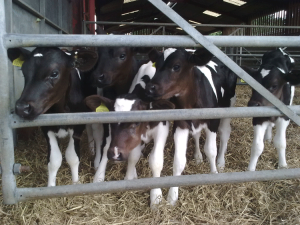 Calves must be reared in a sheltered, hygienic environment. This housing varies between farms – paddocks and sheds of many designs. Whatever system is in place, calves must be stress free and protected from the elements. Calf sheds allow easier control of the calves diet and environment. Care must be taken to avoid contamination of the bedding by sick or scouring calves. Given our climate, shelter from wind and rain is essential. If you can not sit comfortably in the calf shelter in light clothing the shed provides inadequate shelter. Ventilation is also very important. Draughty sheds often cause pneumonia but so too do humid sheds with too many calves or poor airflow. Large airflow well above the calf is ideal. If ammonia can be smelt, ventilation is poor. Johnes disease must also be considered when rearing calves. Prevention of this increasingly common disease centres on separation of calves from cows, cow effluent and from paddocks grazed by cows until they are 12 months of age. Calves need milk for the first 3 to 6 weeks of life to grow and develop. You should be able to store enough colostrum from the second to eighth milking to provide this milk. Calves should be fed 2 litres of warm milk twice daily for the first week to 10 days. 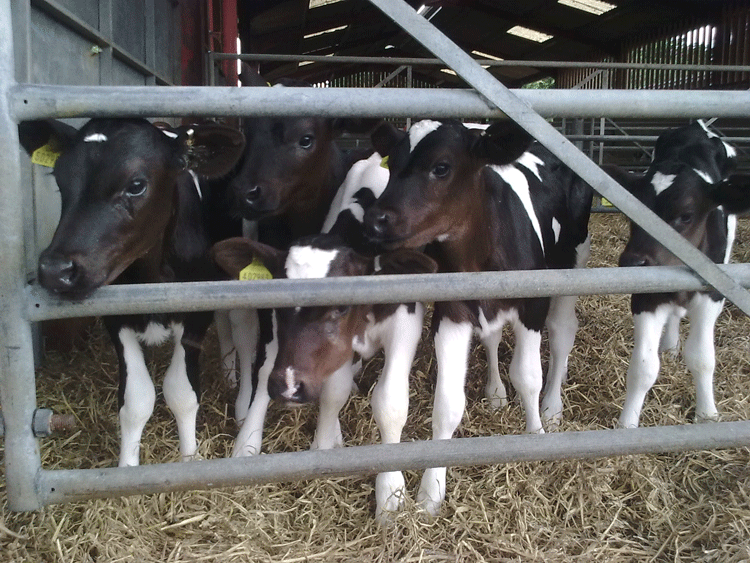 It is important not to overfeed calves in the first few weeks - 10% of liveweight per day as fresh milk is recommended. After this time, calves can be put into small groups of similar sized calves and fed once daily. The milk should be the same temperature each time but can be cold or warm and should be fed at the same time. Until recently, the advice has been to limit milk intake to 4 to 5 L to allow calf growth but ensure the calf starts to eat pellets and develops a functioning rumen. Many farmers follow these recommendations. Recently, it has been found we may be lowering potential production by not feeding higher amounts of milk. If you have surplus milk, feeding more may increase the milk production of the calves when they enter the herd. Even though calves may be in groups, it is ideal to have an individual milk feeding system to quickly identify slow drinkers, sick calves and those not drinking at all. With bulk milk feeding these calves will be missed until too late. The aim of feeding calves is to produce fit, healthy calves which have a functioning rumen and do not suffer a setback when weaned. Calves must always have access to supplement which is 12MJ energy and 20-21% protein, have straw to chew on and have fresh, clean water.